Here is a picture of Haiti Prime Minister Evans Paul at Bassin St Jacques Majeur, Plaine du Nord. 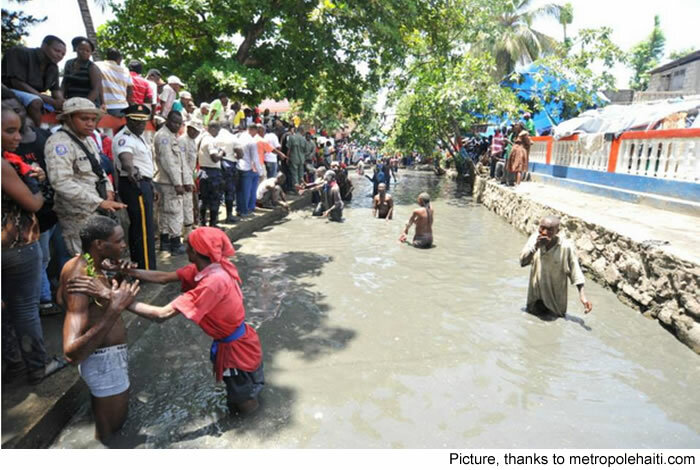 During the patronal celebration of Saint Jacques Majeur at Plaine du Nord in July, 2015, The actual Prime Minister of Haiti, Evans Paul, went to the popular St Jacques Majeur bassin, took off his clothes and went into the water in search of spiritual Voodoo luck, treatment or protection. Many people come every year in this secrete Voodoo place in Plaine du Nord. Some say they receive treatment in this water why others come for luck. Prime Minister Evans Paul's last stop on a tour was to Plaine du Nord. He visited Bassin Saint-Jacques, meeting with town officials and civic society members. He continued to Bois-Caiman, site of the slave revolt, where building of a memorial will be ". . . a universal symbol of freedom against the slavery system"
His final visit was to Nan Brise, a natural spring where voodoo rituals have been held.